The Ron Barassi Snr Park is a new playground and recreational space that opened just last weekend in north west Docklands! The park is named in recognition of Ronald James Barassi Snr who played as a rover for Melbourne Football Club from 1936 to 1940. Ron Barassi Snr went on to inspire the Australian Football League's father-son rule. 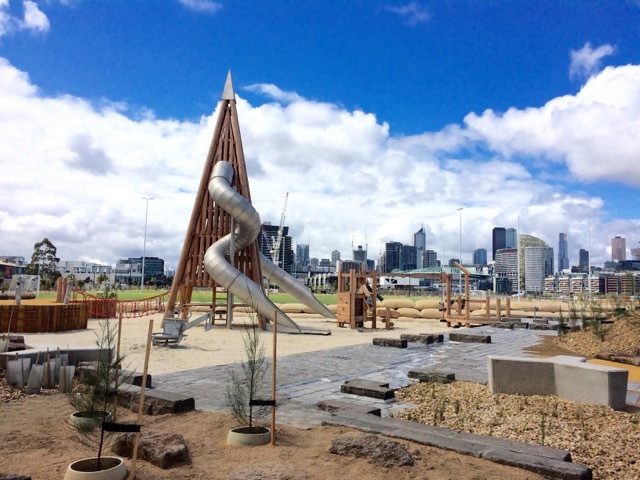 This new playground located in Docklands is sure to be a favourite this Spring/Summer with its sand and water play areas, a giant sandpit surrounding this rocket like structure, two giant slides, some rope bridges, a small slide, a digger, a round swing and lots of grass next to the park to run on. To slide down the big slides, little ones must climb inside the rocket using a ladder at several intervals. Little Miss wasn't keen to try it this time but I am sure she will try it soon. She did however enjoy the water play and the sand play structure. Note: Come prepared with sunscreen, snacks, water, change of clothes and a bucket & spade. There is free parking opposite the playground. The playground is not fenced or shaded. There is some places to sit as well as a picnic table and a bbq area. A unisex toilet is in the building nearby with a change table available. The Ron Barassi Snr Park playground is located at 509-529 Docklands Drive in Docklands. More info regarding the Ron Barassi Snr Park here. Checkout more playgrounds ideas at our playgrounds page or some suggestions to keep bubs cool in spring/summer at our keep bubs cool in summer updated page.